During the mid-1830s, Joseph H. Davis, the artist of more than 150 known compositions, executed watercolor likenesses of residents of southwestern Maine and southeastern New Hampshire. As early as 1832, he specialized in recording subjects in interior settings typical of nineteenth-century middle-class parlors. 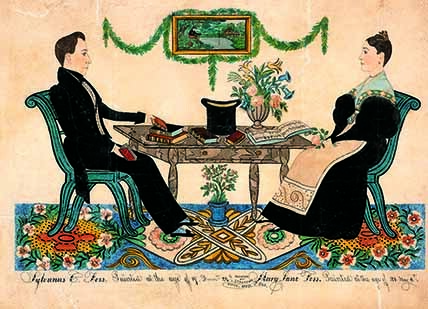 Individuals are seated on ornately grain-painted chairs positioned beside elaborately decorated tables where they read, write, attend to their children and pets, or pursue other commonplace activities. Davis’s tables bear flower arrangements, bowls of fruit, books both tiny and massive, quill pens and ink wells, and gentlemen’s beaver-skin hats. Behind the subjects, parlor walls are decorated with banjo clocks, maps, and pictures, wrapped in swags of greenery that depict the family homesteads or other picturesque scenery. Extraordinary carpets appearing as horizontal bands of geometrically designed pattern across the bottom of the compositions characterize this artist’s work. Like many of his contemporaries, Davis relied upon established networks of introduction to negotiate portrait commissions, allowing him to travel across state lines to unfamiliar regions. Davis’s affiliation with the Freewill Baptist Church is among the most compelling associations to come to light. Many of his sitters participated in this denomination, including Ira Libby, a deacon in the church in North Berwick, Maine, William B. Chamberlin, Sylvanus C. Foss and his sister Mary Jane, Bartholomew Van Dame, Azariah Caverly, and Thomas York, among others. The northern branch of the Freewill Baptists, which practiced full immersion baptism of adults, was founded in 1790 by Benjamin Randall in the town of New Durham, New Hampshire. Many of the towns in which Davis was most active, including Strafford, Farmington, Brookfield, Barrington, and Deerfield, are located within the same cultural region as New Durham and were influenced by Randall’s Arminianist preaching. In several of his compositions, Davis discreetly, but cleverly, alludes to this religious affiliation by portraying these individuals holding the newspaper The Morning Star, an organ of the Freewill Baptist Church. Since Davis’s rediscovery in the twentieth century, several individuals have proposed theories concerning his identity. The complex historiography addressing this artist and his work has been intensified by the fact that his name is relatively common. Although a significant body of portrait work in watercolor has been attributed to him, he appears to have drawn these likenesses for a short period, from 1832 to 1837, thus contributing to his mysterious persona. Most recently, researchers Sybil and Arthur Kern have delved into primary sources across the Northeast to formulate a compelling biography for this man whose identity has been defined principally from the works of art he left behind. They propose that the artist probably was born on August 10, 1811, in Limington, Maine, the son of land trader Joseph Davis and his wife, Phebe. In addition to farming and land speculating like his father, over the years this individual also worked as a manufacturer and an inventor. He lived in several towns in the Northeast, including Saco, Vassalboro, and Newfield, Maine; Morristown, New Jersey; and Wilmington, Massachusetts. He died on May 25, 1865, at the age of fifty-three, in Woburn, Massachusetts. 1. See the portrait of Bartholomew Van Dame (collection Currier Gallery of Art, Manchester, NH) in Robert M. Doty, By Good Hands: New Hampshire Folk Art (Hanover, NH: University Press of New England, 1989), cover. 2. Sybil Kern and Arthur Kern, “Joseph H. Davis: Identity Established,” The Clarion 14, no. 3 (summer 1989): 48–50. 3. The double portrait of Fanny and Ira Libby is in a private collection. The Azariah Caverly family portrait is illustrated in Paul S. D’Ambrosio and Charlotte M. Emans, Folk Art’s Many Faces: Portraits in the New York State Historical Association (Cooperstown: New York State Historical Association, 1987), 64, and the Thomas York family portrait is illustrated in Beatrix T. Rumford, ed., American Folk Portraits: Paintings and Drawings from the Abby Aldrich Rockefeller Folk Art Center (Boston: Little, Brown, 1981), 85. 4. D. Hamilton Hurd, comp., History of Rockingham and Strafford Counties, New Hampshire, with Biographical Sketches of many of its Pioneers and Prominent Men (Philadelphia: J. W. Lewis, 1882), 705–7. 5. Nina Fletcher Little, “New Light on Joseph H. Davis, ‘Left-Hand Painter,’” Antiques 98, no. 5 (November 1970): 754–57; Gail Savage, Norbert H. Savage, and Esther Sparks, Three New England Watercolor Painters (Chicago: Art Institute of Chicago, 1974); Frank O. Spinney, “Joseph H. Davis, New Hampshire Artist of the 1830s,” The Magazine Antiques 44, no. 4 (October 1943): 177–80; and Spinney, “The Method of Joseph H. Davis,” The Magazine Antiques 46, no. 2 (August 1944): 73. 6. Kern and Kern, “Joseph H. Davis,” 45–53. Source: Stacy C. Hollander, American Radiance: The Ralph Esmerian Gift to the American Folk Art Museum (New York: Harry N. Abrams in association with American Folk Art Museum, 2001), 392.